This is not strictly a 'new' Indridason, although it is a first translation into English. It was first published in 1999, a year before the excellent JAR CITY. It is not an Erlendur title, and fans of Indridason will not find it has much in common with his police procedurals. OPERATION NAPOLEON is a straightforward, Hollywood-tinged action adventure with roots in the final days of World War Two. The book opens with a survivor of a plane crash battling through a blizzard on the Vatnajökull Glacier in the south-east of Iceland, dragging a metal suitcase handcuffed to his arm. The plane is not found by US military search teams, but 54 years later, the movement of the glacier brings it back to the surface of the snow. A US satellite spots the plane and a covert team is sent to retrieve it and bring it back to the States. Meanwhile we meet young Icelandic lawyer Kristín. Kristín's reckless younger brother is out testing his snowmobile when he stumbles across the plane. He manages to get a garbled message through to his sister before he is apprehended by American troops. Before long, Kristín is being hunted by two US assassins and is desperately seeking the secret of what is happening on Vatnajökull. There are hints of some of Indridason's trademark motifs - emotionally distant parents, brotherhood, the harsh Icelandic wilderness - but it's clear that he is using OPERATION NAPOLEON to address what seems to be a deeply controversial factor in Icelandic life: the US military presence at Keflavík. Obviously this is an economically, politically and socially difficult relationship, and some of the most effective scenes take place between the Icelandic prime minister and the domineering US military. So far so good, but the plot stumbles at various points, stretching the reader's suspension of disbelief just a little too far. Not least, why would the US go to such lengths to silence Icelandic witnesses when they've allowed the two farmers who spotted the plane and helped with the initial search to live? Kristín never quite takes off as a heroine or as a rounded character, despite efforts to build her back-story. Far more satisfying are the blandly ruthless General Carr and the psychopathic Colonel Ratoff, neither of them doing US-Icelandic relations many favours. So, an interesting theme, but a better book could have been made of it. Although entertaining, OPERATION NAPOLEON is just not up to the same standard as his later work. Indridason clearly hit his stride with JAR CITY. Indridason's regular translator Victoria Cribb has done a good job of capturing the tone of a thriller. A pronunciation guide would be a nice addition, as would a map of Iceland. Finally, don't read the blurb on the back unless you want to spoil a minor surprise. 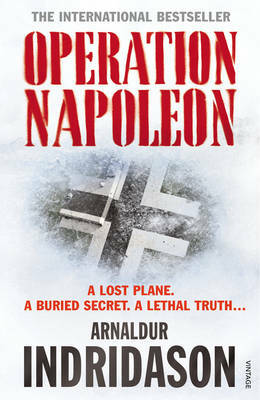 Read another review of OPERATION NAPOLEON.